The enjoy hotel Berlin City Messe, with its 130 rooms offers cozy accommodation in 3 categories. Start each day with a rich and delicious breakfast buffet in our breakfast room (at a extra-charge). In summer you enjoy your breakfast on the adjacent sun terrace. In the evening, relax with a drink and appetizing snack at the bar and in the enjoy lounge. As a business guest you will benefit from its proximity to Messe Berlin and to the International Congress Centrum (ICC; about 5 km). The 2 daylight meeting rooms for up to 40 persons and the group study room are available for your events. Additionally the hotel is the perfect location for your festive event for up to 100 guests. The enjoy team is pleased to advise you in planning and organization of your event. 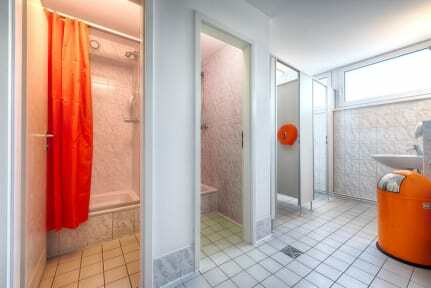 The enjoy hotel Berlin City Messe is located near the highway exit Hohenzollerndamm. The S + U-Bahn station Heidelberger Platz is just 500 meters from the hotel and is within walking distance which takes just a few minutes. Even the legendary Kurfürstendamm is not far, there are only about 3 km. Tegel Airport is located about 8 km north of the hotel, Schönefeld Airport is located about 21 km south-east from enjoy hotel. The main railway station is located about 7 km north-east direction. The functionally furnished double rooms in the economy category with shared facilities. All rooms are bright and spacious and equipped with TV and telephone. The entire house high-speed Internet (WiFi) is available free of charge, the internet terminal in the lobby is also free of charge.